Rose was a truly remarkable woman, loved, honoured and respected by so many. We were privileged to have her as our President. was assumed they would never be a breadwinner. Her father, Arthur Laimbeer, a merchant seaman, was absent for much of her childhood and her mother, Rose (nee Crowley), treated her with an inexplicable lifelong disdain, which may have accounted for her later identification with outsiders and the downcast. Keen to escape her stifling family life, Rose twice during her teens ran away from home to join troupes of travelling actors. She eventually settled into a series of secretarial jobs, most notably with a travel agency in Mayfair. The second world war transformed her routine existence and gave an outlet to her long suppressed adventurous, rebellious spirit. Rose was always reluctant to speak about her wartime role, partly out of modesty, partly due to trauma and partly because of what she described as a “sort of brainwashing we were subjected to during training, in order that we would not break under Nazi interrogation.” She was referring to her enlistment in the Special Operations Executive (SOE) in 1941. The counter-interrogation training was so severe and successful that for the rest of her life Rose had great difficulty in talking about her time in SOE. When she was pressed by her family, it provoked extreme mental and physical distress that sometimes lasted for weeks. According to her account to me, Rose was parachuted into Nazi-occupied France. She spied on German troop deployments and acted as a courier, liaising between the French Resistance and Allied military HQ in Britain. She was once stopped and quizzed by German soldiers but managed to bluff them. When her network was betrayed, she escaped. But others were captured. Rose acted as an informal advisor to the producers of the film Charlotte Gray (2001), about a SOE agent in France. Watching the film bought back painful memories and caused her a temporary breakdown. For many years, she retained her treasured miniature SOE pistol, which she used to hide in her hair to avoid detection during street checks by German troops; only finally surrendering it during a police amnesty in the late 1960s. I was not able to independently corroborate Robertson’s wartime role because many SOE records were destroyed or lost. However, given her reticence to talk about her war work and her frequent distress when she did, I am inclined to believe her. Loyalty to the code of silence is typical of SOE women agents. Apart from a few like Nancy Wake and Odette Sansom, most stayed true to their oath of secrecy and never told their stories. After the war, Rose returned to hum-drum secretarial work for an industrial clothing factory. She eventually married George Robertson, a retired music hall artist, in 1954, and devoted the next decade to her job and bringing up two sons. Rose and George remained happily married until his death in 1984. Rose told me that during her wartime work in France an incident occurred which contributed to her later embrace of the gay rights cause. She was billeted with two young male French Resistance agents. One night she entered their room and found them in an embrace. There was mutual embarrassment all round. Not a word was said for three days. Rose knew nothing about homosexuality and was curious. She eventually plucked up the courage to ask them. Both men told stories of family prejudice and rejection. Their story affected her deeply. She was shocked that parents could be so heartless towards their gay children. But it wasn’t until 1965 that she decided to do something about it. That year she took in two young male lodgers who she quickly realised were lovers. Hearing that they, too, had suffered because of their parent’s homophobic attitudes, Rose was eventually prompted to set up Parents Enquiry, Britain’s first helpline to advise and support parents and their lesbian, gay and bisexual children, which she ran from her Catford home in south-east London for three decades. Rose was soon flooded with over 100 phone calls and letters a week. These came from distressed gay teens, many of whom had self-harmed because of homophobic prejudice, and from parents who were variously bewildered, distraught, angry, guilty, ashamed and hostile towards their children’s homosexuality. Often she mediated between parents and kids, nearly always successfully. As a middle-aged and thoroughly heterosexual housewife, she was a reassuring figure. Occasionally, she was verbally abused and physically attacked by irate mums and dads. Usually she won them over in the end. She was also targeted by homophobes, with arson attacks on her home, excrement dumped on her doorstep and torrents of abusive phone calls and hate mail. 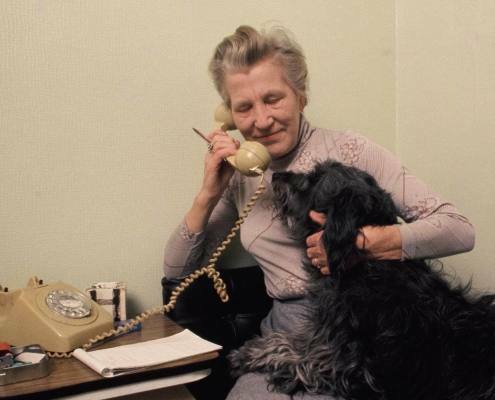 From the mid 70s onwards, a growing number of referrals came from the police and social services. Authorities who had been wary of supporting gay teenagers, some of whom remained classed as criminals until 2001, were impressed by her family-oriented approach to reconciling gay children with their parents. Rose won public support from Marjorie Proops and Claire Rayner, the leading agony aunts of the era. She was a frequent speaker at universities, churches and medical seminars, and was a regular on TV and radio throughout the 1970s and 80s. During this work, Rose discovered a natural flair for therapy and soon extended her counselling to all aspects of sexuality and to a wide range of mental and emotional issues. She refused payment, financing her work from her salary and later out of her pension. Her defiance of convention led Rose into controversial areas that many established psychotherapists steered clear of, notably psychopathy. She had a track record of moderating the behaviour of psychopathic people, often when orthodox methods had failed. From her work on psyhcopathy, Rose came to believe that much irrational behaviour, including some personality disorders and motiveless violence, may stem from emotions absorbed by an embryo before its brain is sufficiently developed. Only a few months ago, she began work on a paper arguing that psychotherapy needed to examine this contentious issue if it was to remain a force for progress. Rose continued working until shortly before her death, aged 94. She died peacefully while sleeping. Her legacy is that she helped thousands of parents and lesbian, gay and bisexual teenagers find understanding, acceptance and reconciliation. Until she began Parents Enquiry, gay children’s parents were unrecognised and unsupported. Rose highlighted a social need. Her pioneering work was replicated by others and it continues today through the services provided by Friends and Families of Lesbians And Gays (FFLAG) and Parents, Friends (& Family) of Lesbians And Gays (PFLAG). Rose is survived by her sons Paul and Chris, her grandchildren Claire, Emma and Matthew and two great-grandchildren. Rose Ellen Robertson, wartime SOE agent, therapist and counsellor to parents and their gay children, born 28 October 1916, died 10 August 10 2011″. We have put together a few of the many tributes we received at FFLAG – ones that we feel reflect the influence that she has had over the generations. “She was a remarkable woman, very much ahead of her time. She was courageous, unassuming and dedicated to improving the lives of gay people and their families, at a time when it was a very brave thing to do. “She was an extraordinary and very able person way ahead of her time. She had enormous courage and great talent. Her booklets, although written forty years ago, have as much insight and meaning as if written today. They are classics and for many of our parent groups they have been our most important informative and supportive texts. “She was indeed a remarkable and courageous woman who led the way and to whom we parents as well as our sons and daughters owe so much.